transition from hospital to home. Experience the excellent breath delivery, stable tidal volume delivery, and intuitive user interface of Vivo 40, designed for invasive and non-invasive respiratory support. Help patients make the transition from hospital to home with Vivo 40, a flexible, advanced, and clinically reliable respiratory solution from Breas. 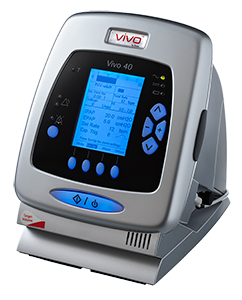 Vivo 40 provides both invasive and non-invasive respiratory support in PSV, PCV and CPAP mode to both paediatric (>10 kg) and adult patients. With the Target Volume feature, delivered inspiratory pressure is automatically adjusted to ensure stable tidal volume delivery to the patient. Combining the comfort and technical advantages of pressure-limited ventilation with the ease of use of volume ventilation, Target Volume obtains delivered tidal volume, adapts to the patient’s lung mechanics, and reduces the need for ventilator adjustments. Thanks to eSync, highly responsive Trigger technology, Vivo 40 synchronizes smoothly with the patient’s breathing effort. As the patient demands for a new breath, Vivo 40 responds immediately and delivers the pressure required. The Enhanced Pressure Support mode gives clinical flexibility when needed, and a maximum pressure of 40 cmH2O offers the ability to treat difficult restrictive conditions. In addition, the Pediatric mode offers an extra margin of clinical safety for young patients. An integrated heated humidifier is available, and an internal battery assures battery operation beyond the external DC supply. Vivo 40 also offers an appealing design and intuitive user-interface, making it an integrated part of hospital or home environment. Low pressure alarm, high pressure alarm, low volume alarm, low breath rate alarm, high breath rate alarm, low leakage alarm, high leakage alarm, low internal battery warning, low power alarm, internal function failure alarms.